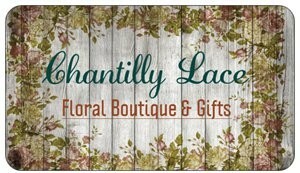 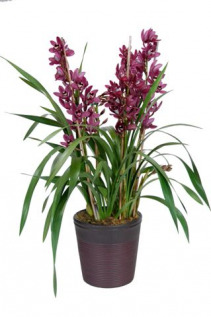 Instant 25% savings!!! 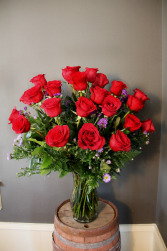 24 stems of our premium long stemmed roses, accented with various greens and filler, designed in a clear gathering vase. 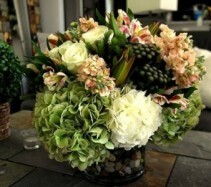 Sure to impress!!! 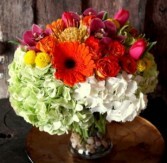 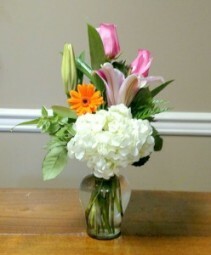 A one-sided arrangement with hydrangea, stargazer lily, gerbera daisy, and roses in a vase. 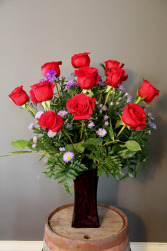 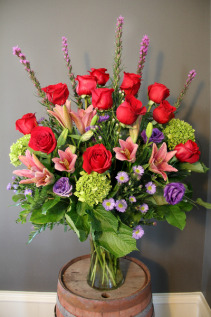 One dozen of our premium long stemmed roses, accented with greenery and filler designed in a red vase. Our classic dozen with added flair. 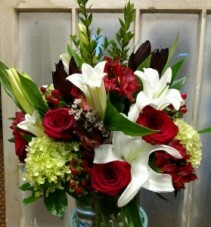 This bouquet comes with 12 of our premium long stemmed roses along with lilies, hydrangea, and Asters, accented with various greens designed in a clear gathering vase. 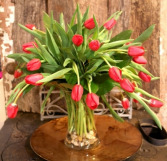 Total of 20 Tulips, straight from Holland, set in a clear gathering vase. 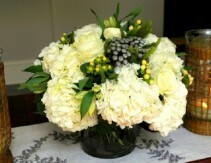 A neutral composition of White Roses, White Hydrangea, Cream Hypericum Berries, Cream Alstro, and Silver Nute. It is designed in a low Cylinder Vase accented with Brown River Rock. Peaches and Cream: A very lush Pave consisting of White Hydrangea, Antique Hydrangea, Peach Stock, Berries, White Roses and Alstro set in a clear round cylinder vase accented with river rock.